Petiroc2A is a 32-channel ASIC designed conjointly by Omega laboratory and Weeroc company. It is aimed for SiPM read-out for time-of-flight application prototyping. It is a complete read-out ASIC embedding a fast trigger line with a 10GHz gain-bandwidth product and a precise energy measurement based on a shaper. Following the very front-end chain, a time-to-amplitude converter allows to interpolate the time of arrival of an event between two master clock tick. 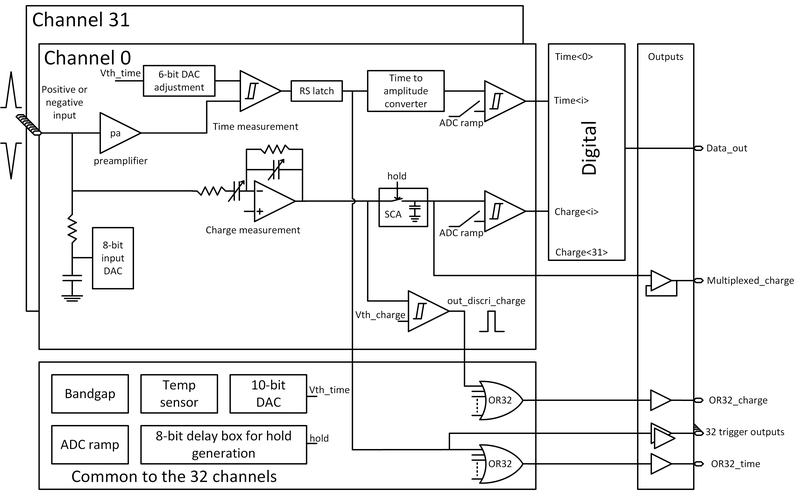 A Wilkinson ADC ensures the analogue to digital conversion of both energy and timing. Digital data are outed through a serial link. Petiroc2A can also be used in different operation mode. Digital back-end can be disabled to allow full-analogue mode. In that case, analogue data and channel triggers are outed directly and can be exploited at the user needs. A photon counting operating mode can also be set up. In photon counting mode, the 32 triggers are available and photon counting up to 120MHz has been measured. Latest measurement on Petiroc2A will be presented in all of the three operating mode of the ASIC. In full digital mode, linearity and intrinsic timing resolution will be exposed. In analogue mode, maximum event rate will be shown with associated timing and energy resolution. In photon counting mode, maximum frequency will be shown. Beyond electrical measurements, nuclear measurement will be exposed such as CRT and energy resolution from measurement done at CERN and at several of Petiroc2A user facilities. Latest measurements on Petiroc2A front-end read-out chip will be presented. That ASIC aimed for SiPM read-out for time-of-flight application prototyping is a complete read-out ASIC embedding both trigger line and energy measurement. Measurements presented will include results on several operation mode of the ASICs : full difital mode, analogue mode and photon counting mode. Timing resolution, energy resolution, count rates will be shown as well as nuclear measurements results.